Vanton FLEX-I-LINER® peristaltic type rotary pumps transfer, sample or meter acids, caustics, solvents, salts, chlorides and reagent grade chemicals — even viscous fluids and slurries containing soft solids and abrasives. Only two non-metallic parts contact fluid — the rugged thermoplastic body block and durable, replaceable elastomeric flexible liner. This easy-to-service construction keeps maintenance and downtime low. The wide choice of thermoplastics and elastomperiers in which these pumps are furnished permits their use over the full pH. Pumping is accomplished by a rotor mounted on an eccentric shaft rotating within a flexible elastomeric liner. This creates a squeegee action on the fluid, which is trapped between the outer surface of the liner and the inner wall of the body block. Only the rigid thermoplastic body block and the flexible elastomeric liner contact the fluid being pumped. Body blocks are available in polypropylene, UHMW polyethylene and Teflon®. Flexible liners can be furnished in natural rubber, Neoprene®, Buna-N®, Hypalon®, Viton®, Nordel®. The gentle peristaltic pumping action minimizes foaming, prevents settling out of suspensions and permits safe handling of latex emulsions and other shear-sensitive liquids. Sealless, non-metallic and self-priming, FLEX-I-LINER® pumps operate in either direction, wet or dry, in any position. Their unique design eliminates shaft seals, glands, internal seals, stuffing boxes and other potential sources of leakage. with rotary vane air motors or with variable speed drives for metering purposes. Over 140,000 of these dependable sealless, self-priming pumps are in service handling aggressive and other problem fluids. r contact the fluid being pumped. Body blocks are available in polypropylene, UHMW polyethylene and Teflon®. Flexible liners can be furnished in natural rubber, Neoprene®, Buna-N®, Hypalon®, Viton®, Nordel®. Pump bodies are provided in polypropylene, Teflon®, UHMW (ultra high molecular weight) polyethylene, and other non-metallic materials. Stainless steel body available on request. The heavy duty replaceable flexible liners are available in a wide choice of chemically resistant natural and synthetic elastomeric materials, including natural rubber, Neoprene®, Buna-N®, Hypalon®, Viton® and Nordel®. Field replacement of the precision molded flexible liners is accomplished without the use of special tooling. The design eliminates stuffing boxes, glands, shaft seals, gaskets or internal valves. The pump is self-priming and capable of running dry. Shaft and rotor bearings are completely isolated from the fluid cavity, eliminating any danger of corrosion, or contamination of the fluid being pumped. Pumps are suitable for vacuum and gas sampling service, for handling volatile liquids, viscous fluids, and slurries, even those with soft solids. A rotor mounted on an eccentric shaft oscillates within the flexible liner, imparting a progressive squeegee action on the fluid trapped in the channel between the liner and the body block. Flanges on the flexible liner are pressed to the side of the body block by concentric grooves on the pedestal assembly and the cover plate. This serves to isolate the fluid to the channel. Pump models are available close-coupled or pedestal-mounted to an electric motor, or air-powered for handling volatile fluids.These pumps are ideally suited for use on a variety of stationary and mobile acid buggies for the transfer of chemicals in laboratory and plant operations as well as for incorporation on OEM equipment.FLEX-I-LINER® pumps are also available in duplex configurations with manifolds providing common suction and discharge connections, and in sanitary designs with flame-polished interiors and quick-disconnect fittings. The wide choice of thermoplastics and elastomers in which these pumps are furnished permits their use over the full pH range and for an endless list of corrosive and abrasive clear and viscous fluids. 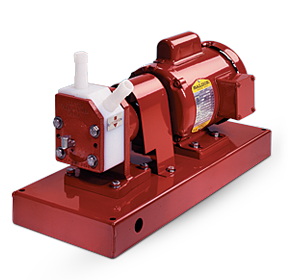 FLEX-I-LINER® pumps are available close-coupled to an electric motor, or pedestal-mounted with electric motor drive or gasoline engine, as well as air powered when required for handling volatile fluids. For metering and dosing, variable speed motors or belt drives may be used. Models may be hand carried, installed on casters, or wheel-mounted on mobile equipment for portability. FLEX-I-LINER® self-priming pump is ideal for sanitary metering of pharmaceuticals, foods, and other contamination-sensitive products. The body block in the unit illustrated is molded of UHMW polyethylene with flame polished interior surfaces, and spin-welded suction and discharge quick-disconnect fittings. The rugged flexible liner is molded of food grade elastomers. Metal never touches fluid. For pumping volatile chemicals and gases where safety requirements prohibit the use of electric power, or in remote areas where electric power is not available, FLEX-I-LINER® pumps can be supplied with rotary vane air motors, which develop 2000 rpm on 90 psi (620 kPa). These motors can be furnished in models for clockwise rotation, or reversible operation to change flow direction. Control of the air motor drive offers a convenient means for varying flow rates. Variable speed FLEX-I-LINER®pumps offer automatic dosing capability with dependable accuracy. A sensor immersed in the fluid being treated continuously relays data on pH, conductivity, or other variables, to a controller which adjusts pump motor speed and dosage rate. The design simplicity reduces the cost, maintenance, downtime, and complexity associated with dosing and metering applications. Ideally suited to evacuate drums, the FLEX-I-LINER® pump is self-priming, can run dry for extended periods, and is simple to maintain. It also runs slowly — 1750 versus 5000 rpm for typical drum pumps — and offers greater safety and convenience in a diversity of situations. Compact in size with integral handle, it fits neatly on drum lids without hazardous protrusions, and has sufficient lift characteristics to operate from the floor, skid or stand. “Duplex” FLEX-I-LINER® pumps offer 70 percent higher flows than “Simplex” configurations while minimizing vibration at higher pressures. One motor/gearbox drives two opposing eccentric shafts oriented 180? out of phase/rotation, canceling pumping pulsations generated within each fluid cavity. Manifolds provide common suction and discharge connections. Duplex systems are available in the same thermoplastic and elastomeric materials as single-stage units.